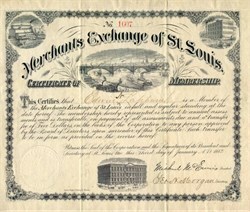 Beautifully engraved certificate from the Merchants Exchange of St. Louis issued prior to 1899. This historic document was printed by the James Hogan Printing Company of St. Louis and has an ornate border around it with a vignette of the Eads Bridge with the city's skyline in the background, various riverboats, and the Merchants Exchange Bank of St. Louis. This item is hand signed by the Company�s President and Secretary and is over 113 years old. The Merchants' Exchange of St. Louis was organized in 1836 for the purpose of trading cash and futures products, including barge freight. The Merchants� Exchange is the oldest organized cash commodity market in the United States. Since its founding in 1836, the Merchants� Exchange of St. Louis and its members, who once numbered over 6,000, have played a central role in the cultural, political and economic fabric of the St. Louis community. For most of its history, the Merchants� Exchange was housed in an elegant building in downtown St. Louis, Missouri. It boasted the largest open room west of the Mississippi River. In its first century, members of the Merchants� Exchange, a veritable Who�s Who of the region�s political and economic elite, would trade a wide array of cash and futures contracts during the daily trading sessions at the Merchants� Exchange. Contracts that have been traded at the Merchants� Exchange include corn, soybeans and hogs, in addition to buffalo skins, barrels of whiskey and, of course, barge freight. In the wake of the Great Chicago Fire (October 1871), Merchants� Exchange members buried their rivalry with the Windy City and spearheaded a relief initiative that sent trainloads of food, blankets and clothing, along with $150,000 in cash, to victims of the conflagration. In 1874, Merchants� Exchange members formed a bridge company and financed the construction of the Eads Bridge, the first bridge to span the Mississippi and an engineering marvel in its time. Leaders of the Merchants� Exchange believed that the bridge was a sure-fire means for St. Louis to establish preeminence over Chicago for economic hegemony in the Midwest. Two years later, the Merchants� Exchange hosted the 1876 Democratic National Convention on its grand trading floor. That convention nominated Samuel J. Tilden as the party�s candidate for U.S. President. Tilden subsequently lost the election Republican Rutherford B. Hayes by a single Electoral College vote. In the late 1950s, the grand old Merchants� Exchange building was razed in the name of urban progress. Its members, numbering about 1,000 moved to a new building and state-of-the-art-trading floor in downtown St. Louis. In this new location, members continued to buy and sell commodity contracts as they had always done. A historic event occurred at the Merchants� Exchange when on May 20, 1958, the exchange voted to admit women to become members. The exchange was the first grain exchange to drop its men-only rules with the admission of Miss Ruth S. Moegle, a corn buyer and supervisor for Anheuser-Busch�s grain and residual sales division. Up until that time she had been buying by telephone since women were not allowed membership and consequently were barred from the trading floor. In 1995, through the exercise of eminent domain, the City of St. Louis took possession of the Merchants� Exchange building so that the city�s Science Center could be expanded. Although the Merchants� Exchange has a well-established history of sponsoring trading in futures contracts, it has been several decades since futures contracts have been traded on the exchange. The Merchants� Exchange has recently been approved by the CFTC as a designated market for the trading of futures contracts. The first futures contracts to be sponsored by the Merchants� Exchange under its renewed mandate for such trading will be two new barge freight rate futures contracts. These futures contracts complement the cash market for barge freight that has been conducted through the Merchants� Exchange for over 100 years and will ensure continued viability of and universal access to the bulk commodity transportation markets. The recent change in the Chicago Board of Trade�s delivery system for corn and soybeans has highlighted the need for additional risk management tools for barge freight rates. The futures contracts to be offered by the Merchants� Exchange will be a useful hedging tool for those who ship grain and other bulk commodities along the inland river system, as well as for those who operate barge or rail lines. In addition, the futures contracts will act as a safeguard against manipulation of the futures markets in certain agricultural products. Today�s Merchants� Exchange represents the new era of electronic trading. It is the only demutalized and fully electronic and independent futures exchange in America. As we begin the new millennium, the Merchants� Exchange is well positioned to continue its strong historic heritage well into the future. The St. Louis bridge, a massive structure, was completed in 1874 at a cost of over $10,000,000. It consists of three spans, the center one being 520 feet long, and the other two 500 feet each. The piers upon which these spans rest are built of limestone carried down to bed rock. The main passage for the accommodation of pedestrians is 54 feet wide, and below this are two lines of rails. The merchant's bridge, 3 miles N., was completed in 1890 at a cost of $3,000,000. The latter is used exclusively for railroad traffic.